Kalamay-hati, also called Calamay or Matamis sa bao, is a native delicacy that is popular in Bohol and in many regions of the Philippines. 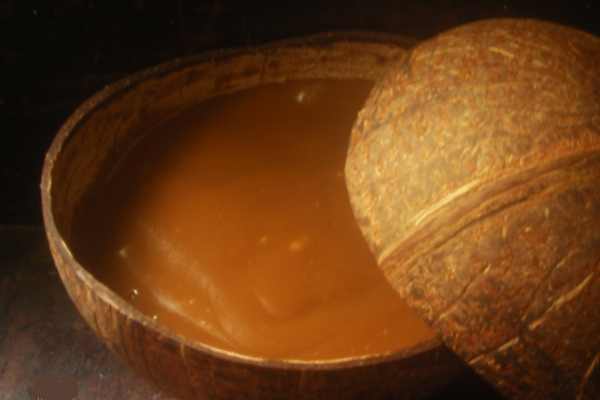 It is a mixture of coconut milk, brown sugar, and ground sticky rice. Peanuts, margarine, peanut butter, or vanilla can be added to the mixture for added flavors. Note 1: If cooking for more people – just always have this ratio – 1:1:2. Note 2: Light brown sugar is fine too. I prefer to use dark brown sugar because it is closest to muscovado, which is used by my lola (native kalamay-hati recipe from Negros). 1. In a large saucepan/wok, combine coconut milk and rice flour. Stir until there’s minimum lumping in the mixture. 2. Cook in medium heat. Stir while cooking to prevent mixture from sticking at the bottom of the pan. Note 3: Stir in one direction only to minimize lumping. 4. Add dark brown sugar and keep on stirring until mixture thickens to needed consistency. 5. If you want your kalamay to be thick and sticky, cook it in low heat. It is already thick enough when it is a little heavy for you to stir it. Just keep on stirring to avoid burned mixture at the bottom of the pan. 6. Take off from heat and cool. Serve plain or sprinkle sesame seeds on top or serve as “palaman” (condiment) for Pandesal. Hi.. Asa ta makapalit ug calamayhati dre sa dumaguete?